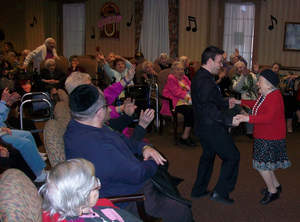 MONSEY, NY--(Marketwire - January 25, 2011) - Approximately 100 residents at Northern Services Group's FountainView complex came together to celebrate the new year with singing and dancing on Monday afternoon. The event, which is a first at the independent living facility, provided the residents an opportunity to sing-along to their old favorites, learn a few new dance moves and most importantly enjoy themselves while staying active. "It was so nice of Palisades to support this event for us seniors," stated a FountainView resident. "We all had a great time keeping up with music and dancers and hope to do this again soon." The entertainment which featured a DJ, MC and six interactive dancers kept the party going while encouraging the residents to learn the newest dance steps. "We're delighted to have had the opportunity to provide the FountainView residents with an afternoon of singing and dancing," said Mark Welshoff, President & CEO of Palisades Federal Credit Union. "We take our hats off to the Northern Services Group facility, Marlene Gittlitz, Director of Recreation and the entire Recreation Department at FountainView for executing a successful event and continuing to support Rockland's senior community." The NY Credit Union generously provided funds for the event and various gifts for residents. "We are truly grateful to Palisades Federal Credit Union, the entertainers and the FountainView staff," stated Frank Posa, Recreation Supervisor at FountainView. "For many of our residents, dancing was something they never imagined doing again. Seeing the excitement and happiness in their faces was extremely rewarding and we couldn't have asked for anything more." Headquartered in Pearl River, NY, Palisades Federal Credit Union (www.palisadesfcu.org), with more than $150 Million in assets, is the largest Rockland County based Credit Union. The New York Credit Union operates 4 branches and provides full service banking products and surcharge-free access to over 35,000 ATMs nationwide. Credit Union membership and Credit Union loans are open to anyone who lives, works, studies, or worships in Rockland County, NY.